Friends, I've decided, after much internal debate, to begin transferring my public blog over to my art website. Sunny in Saint Olaf has been an adventure and I'm so happy to have had these last five years documented to look back on. Realizing my posts are leaning more into my art (and the art world around me), I'm excited to make the transition. I hope you'll follow me on Facebook over on Jillian Webb Art and check in with my blog on JWebbArt.com for all things art, photography, and more! There are several goals I have for 2019 and one of them is to reuse, Upcycle, and be more conscientious of our plastic waste. I know I will fall short on this, but any amount of effort we can make is better than none. While I wish there was a commonly used safe biodegradable alternative to the amount of plastic used throughout our everyday lives, I was happy to see a fast food chain encourage the reuse of their plastic containers. We just stopped at a KFC in Ohio on our way home from the holiday. We always stop as quickly as possible when driving across the country and especially when loaded down with a toddler and a collie. 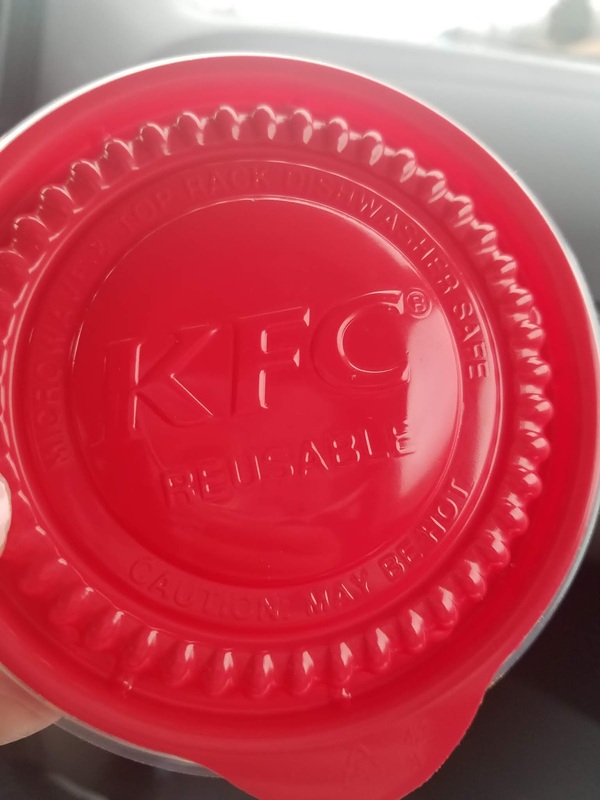 The food was yummy, the service was nice, and to our surprise we noticed this KFC is attempting to encourage reusing their containers. First we noticed their straws seem to be made from a new material and the tops of their plastic containers are clearly labeled, "Reusable - microwave & top rack dishwasher safe". My husband and I were both pleasantly surprised and I thought it worth sharing. While I'm still going home with more plastic, at least I plan to reuse these containers instead of throwing them out. I'm happy for this tiny step in the right direction. If everyone can take small steps what a difference it could make! 2018 has been another year filled with art, family, and fun toddler adventures. Like any, it's had its share of ups and downs, and lessons learned. It's been challenging and amazing. It's been a year of growth and exploration. I have stuck to and accomplished some of my goals and dreamt up more along the way! I've made new friends and clients, continued to grow my business, spent lots of time with my precious toddler, volunteered in the community, pulled off a couple of cross country trips, was featured in art exhibits in McGregor, Elkader, and Guttenberg, and so much more! With all of the craziness, I'm honestly looking forward to the winter and hibernating with my family and art. Cheers to finding balance and making more time to spend with friends in 2019! This has been a wonderful year and I couldn't be more grateful. 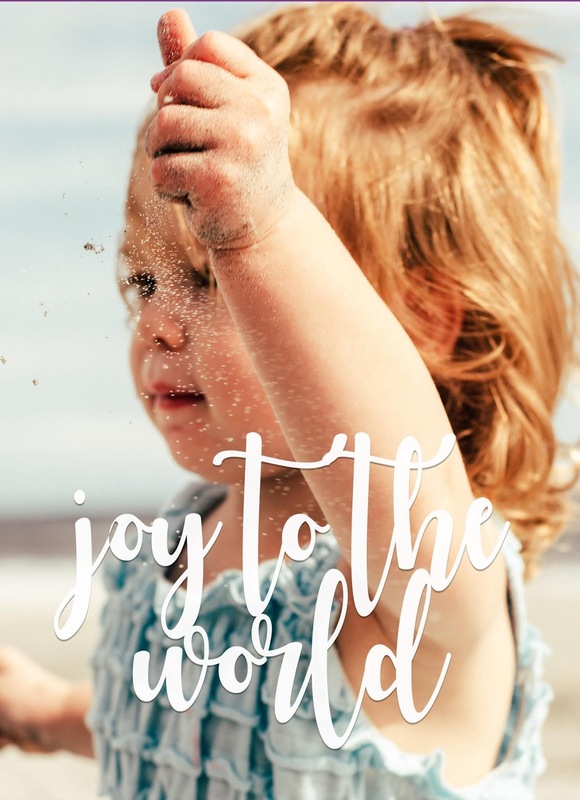 Thank you to every one of our clients, new friends and old friends, and family for making 2018 so special! We wish all of you a very Merry Christmas and a super HAPPY 2019! Prayers for finding true joy in the small things! This loving exhibit is filled with layers of history, thought, and some materials you might not expect to find in artwork-- making it all the more intriguing to me! Marsha hunts for silverware that she transforms into fine jewelry. One can guess that the hunt is a fun part of her creative process. Gertrude's paintings are earthy and make you feel warm and cozy. They feel familiar. The collage works by Gail Larson dive into the realm of obsession and story telling. There's a rich narrative, instantly reminding me of Joseph Cornell, the American master of assemblage. Each of these artists have taken their fascination with the world around them and mastered their own on quirky artistic process. I find them equally charming as quirky, and can't wait to get back for another look! Like I mentioned, I didn't get to spend near enough time and hope to get back to the gallery before they wrap up for the season on December 16th. I encourage you to do the same! In the meantime, I hope you enjoy this preview here on the blog. Thank you to the folks at The Left Bank Shop and Gallery and The McGregor Marquette Center for the Arts for creating such an amazing space to shop and view fantastic art in northeast Iowa, and for this wonderful avenue for us artists to display and sell our work! This has been a wonderful season and I look forward to exhibiting at the Left Bank Shop and Gallery in McGregor, Iowa again in 2019! Again, a reminder that this final special exhibit for 2018 is "Art from the Attic" and you can still check it out for a few more weeks! Please notice that the gallery hours have been shortened for the winter: Friday, Saturday, and Sunday from 9 AM to 5 PM. You still have just a few weeks left to do some unique and thoughtful holiday shopping before they wrap up for the season! Below are a few current images that I took from the retail side of the gallery. The Left Bank Shop and Gallery is a great place to shop for original art in Northeast Iowa! Thank you to everyone for shopping small and supporting your local artists! This is one amazing human being. She's beautiful on the inside and out, and I was so honored she asked me to photograph her. My sessions are typically in the late afternoon or early evening, but we switched it up for this mid morning stroll through the woods and wildflowers of northeast Iowa earlier this summer. 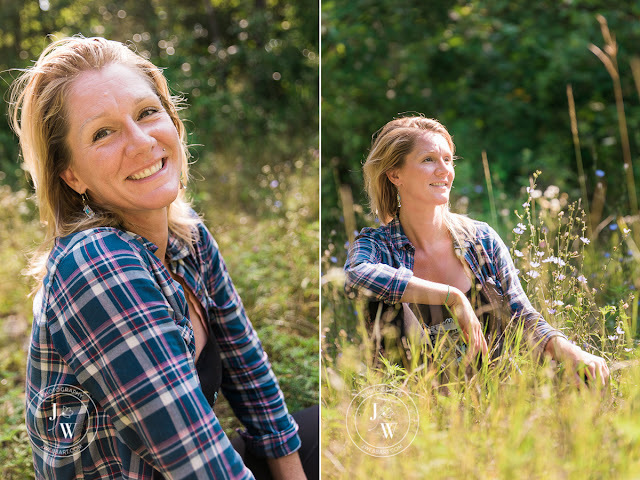 The light was gorgeous and the trees and land provided a breathtaking backdrop as we talked about life, love, politics, new ideas, and her dream - the 30 Day Gratitude Project . We actually met awhile ago, but this was our first time spending quality time one on one together and it was so refreshing getting to know her and enjoy the great outdoors together! Breathe in the fresh air, the light, and the love that radiates from all of the wonderful souls who walk the earth with us. I'm grateful for the awareness that we're all in this together. 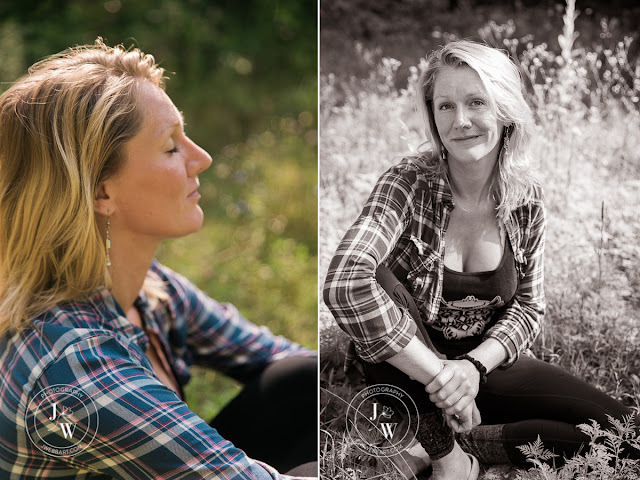 More about her 30 day gratitude project coming to the blog soon. Five years ago my husband and I packed up a twenty-six foot Penske truck and moved 1,000 miles from North Carolina to Iowa. It’s been an amazing adventure. We feel so blessed to raise our baby girl in such a beautiful area and with 164 years of family history surrounding us. We've loved fixing up the family home and sharing it with you on here, but today's post doesn't feature our 100-year-old farmhouse. Today, I get to treat you to a photo tour of a brand new home in NE Iowa. Lucky for us (and for our baby girl), it wasn’t long after our move that my husband’s parents decided they also wanted to move back to Iowa! After lots of planning and looking ahead to retirement, they broke ground on their forever home last fall. Most of the final touches have been made, they’re officially moved in, and it is GORGEOUS! I'm so excited that I get to share this beautiful home with you on the blog. Sorry, not sorry, for the picture overload. I couldn't help myself! I love the modern neutral color palette throughout, the spacious open floor plan, the wall of floor to ceiling windows and all of the thick white trim. I LOVE the kitchen cabinets, the show-stopper counter tops, the shiny new appliances and all of the champagne gold accents. The butler's pantry is pretty awesome and each of the three bedrooms are all king sized suites. The first floor master suite is absolute perfection, and the views of the Mississippi River and beyond are spectacular from every single room! This house is breathtaking, and Gima and Doc keep it pristine, even after a visit from their favorite two year old. Each detail is thoughtfully designed and showcases my mom-in-law's fabulous taste and talent.I'm going to let her help me with the photo captions so that she can acknowledge all of the amazing people and businesses who helped create their dream home. Just one more thing before I go... I’m sure she will humbly leave it out, so let me inform you that the exquisite interior design choices were all made by Dawn Herrmann herself. Dawn not only retired from being a fabulous organist, she also retired from nearly thirty years working as a showroom manager at High Point Furniture Market, the last several with Abigails. She has always had an eye for design, elegant taste, and had beautiful homes, but this one is my new favorite! Bravo, Mom (and Doc, too)! I'll take credit for the adorable little one who jumped into a few of the photos. So here goes -- (we) hope you enjoy this virtual tour and appreciate the notes about the many different design aspects, vendors, and decisions that went into creating this masterpiece on the bluffs of the Mississippi! Maybe it will inspire some ideas of your own. Cabinet color and trim: Sherwin Williams "Dover White"
Island cabinet color: Sherwin Williams "Library Pewter"
Wall color throughout main floor: Sherwin Williams "Accessible Beige"
Black accents: Sherwin Williams "Black Magic"
Flooring throughout the main floor: Kentwood Maple "Armadillo"
When our Tar Heel Lanes in High Point, NC, was being demolished, a lane was salvaged with the idea to make it into a dining table to enjoy casual meals while river gazing. Thanks to Cousin Pat Hopkins for his hard work in making it our sentimental conversation piece. The Sherwin Williams color match system did a great job in suggesting "Library Pewter" to match the Drexel Heritage sofa table that would be near the island. It's a funky greenish brownish gray. With no kitchen overhead cabinets, the wide drawers offer plenty of reachable space for flatware, dinnerware, glassware, and cookware. A "tech" closet beside the floating desk and IKEA bench hide the router and printer. A prep kitchen to house pantry staples and small appliances keeps the main kitchen tidy. The countertop is Silestone "Grey Expo". of a built-in ($1,000+) since it isn't a heavily used appliance for us. Glassware, mercury glass, and Italian ceramics by Abigails are everywhere! 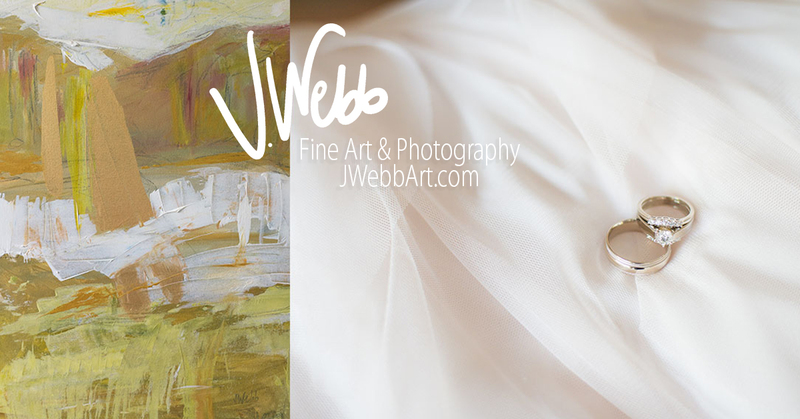 A J Webb abstract adds glimmer with its metallic hues. Having the laundry in the master suite is handy for empty nesters. The walk-in shower is groutless panels by Onyx, making it easy to clean. Even with a wide doorway and zero entry, the water doesn't spray out of the shower. A mirrored pocket door conceals the stairs. The flooring throughout the lower level is Congoleum Triversa vinyl plank in Brown Glaze. This is truly a dream home overlooking The Great Mississippi River in northeast Iowa. I’m so pleased my in-laws let me share their beautiful home with you on the blog today. We hope you enjoyed the tour and possibly picked up some fun ideas for your own dream home! I am excited to also be working on a new painting for the gorgeous glass filled foyer! I'll update you when it's complete! 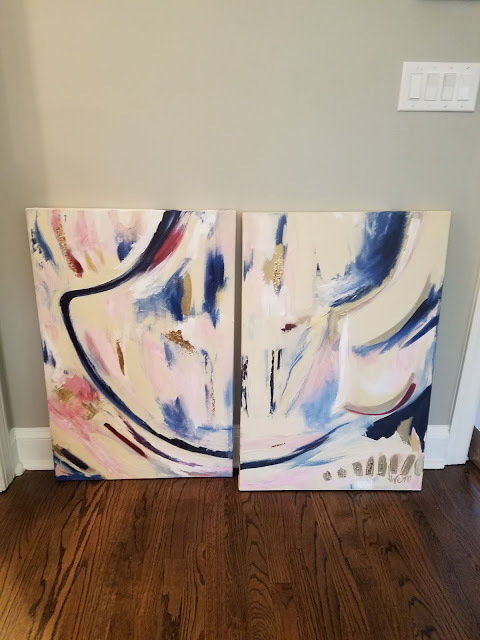 Want to update your space with fresh custom artwork? Want beautiful images of your home or a home you wish to sell? Find more information about my original fine art at JWebbArt.com or send me an email Jillian@JWebbArt.com. P.S. Welcome HOME, Gima and Doc! 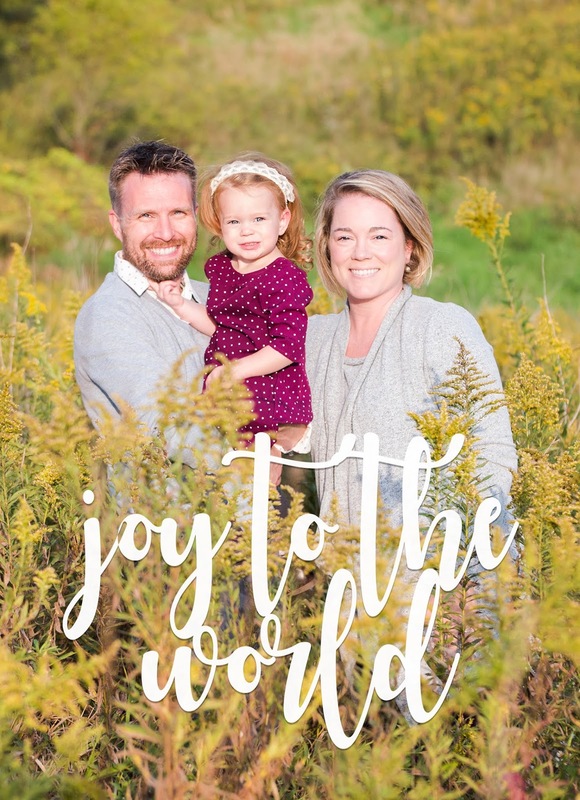 We're so happy to have you both in Iowa... especially your little punkin!